I’ve written a couple of thank you notes on behalf of Patriots fans in the past (check out my thank you note to Tom Brady), but I felt that Rob Gronkowski deserved his due since it has been speculated he will retire following Super Bowl LIII. 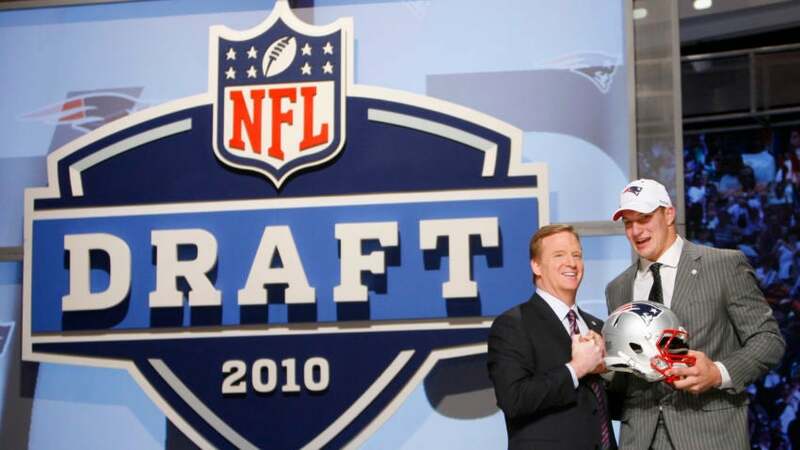 Robert Gronkowski, or “Gronk” as most know him, began his career as the epitome of a great New England Patriots’ draft pick: a highly-touted collegiate player who slipped in the NFL draft because of his prior injury history that scared teams away. The 1st-round talent slipped to the 42nd overall pick of the 2010 NFL Draft where the Patriots made a trade with the Oakland Raiders to make sure he would not slip any further. Gronk introduced himself to the NFL and the world sporting a Patriots helmet and then dancing with his family on stage. We got the first look at the next generational tight end and his wild personality that night. The New England faithful did not know much about Gronk and his story, but it wouldn’t take long for him to captivate the hearts of Patriots fans and the world. Rob Gronkowski’s worst full season from a statistical standpoint is easily his first season. He had 42 catches on 59 targets for 546 yards. He did, however, have 10 touchdowns and emphatically slammed the unsuspecting and helpless football into the turf after each score. Players had been spiking the football after touchdowns since the game was invented (might need a fact check on that), but he redefined this action and carved out his own version: The Gronk Spike. His herculean spikes were where fans first saw a glimpse of the kid-like monster and reminded us all that football is still a game and is meant to be enjoyed. Of course, football becomes that much more fun when you are 6’6″, 265 lbs, can bully everyone in the schoolyard, and were molded by Zeus himself (two Greek mythology references so far, someone please stop me). At the time, Gronk set the single-season record for both receiving yards and touchdowns for a tight end. It only took him two years, but he was already becoming one of the most dominant tight ends in NFL history. This success would continue throughout his career, although he was marred by plenty of injuries. Injuries have limited him his entire career, including when he was in college, but he has fought through all of it. On the field, however, you couldn’t notice any of these injuries affecting his play or spirit as he always has a smile on his face and loves to throw in a shimmy or two after a big score. New England quickly fell for his fun-loving, outgoing personality and his dominant play on the field. He’s given us so many memories both on and off the field that it’s sometimes tough to keep track of them all. From his classic “Yo Soy Fiesta” line from when he first came into the league to an endless number of 69 jokes, Gronk continues to act like a grown man-child and we can’t get enough of it. It’s not just his personality that hooks you in, either. He has dominated the tight end position and other teams more than rock ‘n roll did in the ’80s. Rob Gronkowski is the quintessential tight end in the NFL: he is one of the best receiving and blocking tight ends in the league and that combination makes him one of the best of his generation. Over his illustrious nine-year career, Gronk has amassed 79 career touchdowns and has had a smile on his face for all of them. On every play, he is easily able to bounce off defenders and overpower them with his physicality. It really is a sight to behold. The best part about Rob, for the most part, is that he never moans or complains about his role on the team. Sure, he’s been the centerpiece and focal point of the Patriots offense for almost a decade now, but his truest colors have shown this year when his numbers haven’t been as stellar in years past. He’s a selfless player and teammate. Plain and simple. If this is, in fact, Rob Gronkowski’s final game of his NFL career, then everyone should enjoy this Super Bowl and admire a career of a player who, although it wasn’t the longest, dominated his position like no one else. Hopefully, the Patriots can send him off into the sunset after a Super Bowl LIII victory. In the 15 games that Gronk has played in the playoffs, Gronk has 75 catches, 1,076 receiving yards, and 12TDs. The team has gone 11-4 in these games. For potentially one last time, it’s time to Gronk out.